Here are some additions for your Lemax Christmas Village or for your general decor. They are polyresin and measure approximately 3.54 x 2.95 x 1.42″. A steal at $5.39. Roll right on through the holidays. Herb Lester Associates designs beautiful things like maps of long-gone swinging London, clever little books and this tape. 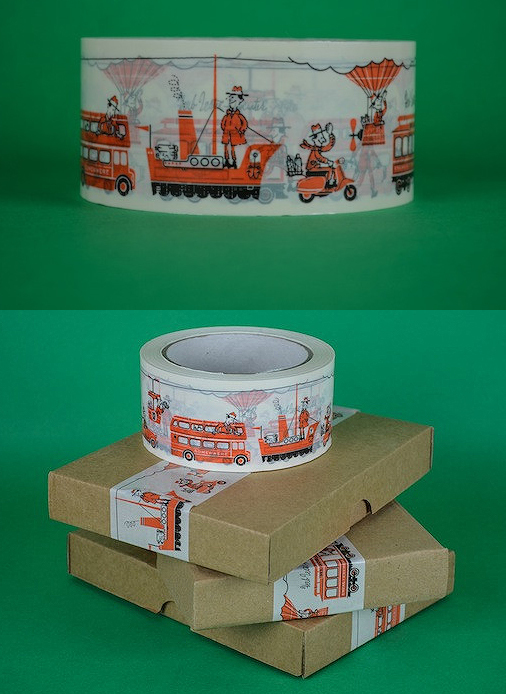 Illustrated by Jim Datz, it’s perfect as packing or wrapping tape for the holidays. But it’s not Christmas-specific so it can be used year-round. (It appears to depict a cowboy visiting London in fact!) It’s 50 mm wide and is Â£6.50 a roll. No cleaning up after reindeer! 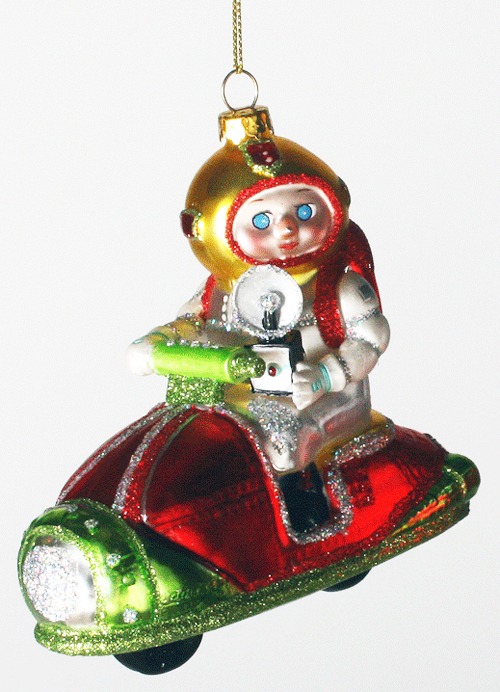 However this ornament will clean out your wallet – it’s $22.95! But oh how detailed and glitterlicious! I especially like his “Ho Ho Ho” pennant and the fancy headlight! Here is a set of salt and pepper shakers made by 180 Degrees. They’re magnetic so they stay together. 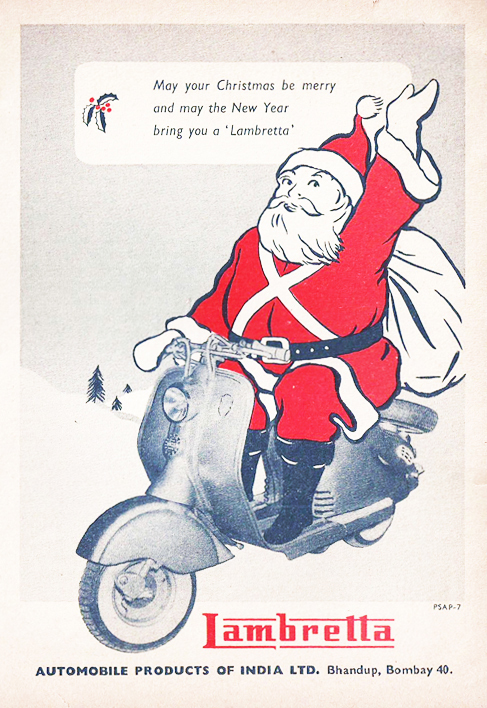 Assuming the Santa is the salt and the scooter is the pepper? 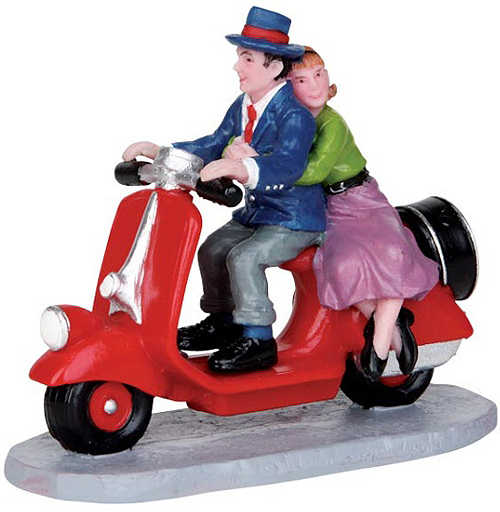 The set measures 4.5″ when together with the scooter measuring in at 3.5″. They come gift boxed and the price is $18.25. I can’t remember who sent me these lovely photos and this tip so please let me know so I can add it to the post. Cheers. Scooterswag.com has its first sponsor! ScooterPatch.com is in fact ScooterSwag.com’s very first sponsor. And I would love it if you would visit their site and take a look around. They have made fantastic rally patches for quite a few of the rallies I’ve been to as a Pacific Northwestern-er. And now they’re expanding their wares to include flags (pennants), keychains and other lovely swag. And as a reader of ScooterSwag you get 10% off your first order. So order up some more club patches and start designing your rally patches now while it’s crappy riding weather. Because rally season is just around the corner. Here’s another Christmas ornament spotted on eBay that looks like it’s made by the same company that made this Space Santa. Will let you all know if I can figure out an online source for these. 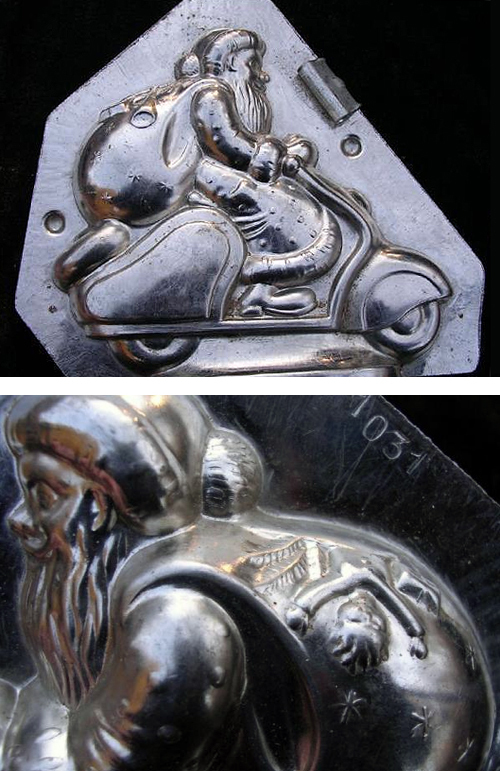 Scooter Santas for us Yanks. Remember this great ornament that I thought was only available in the UK? 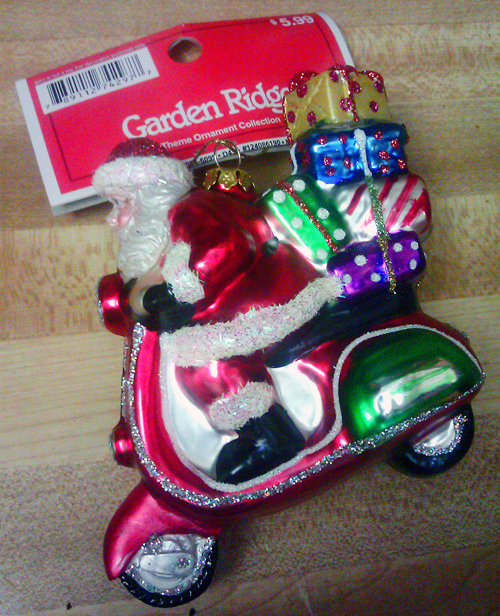 Well it turns out if you live in the US and are lucky enough to have a Garden Ridge store near you, you can walk in and buy this ornament for just $5.99! That is of course if fellow swaggers haven’t already beaten you to it. ; ) Now don’t pout if there isn’t a store near you. 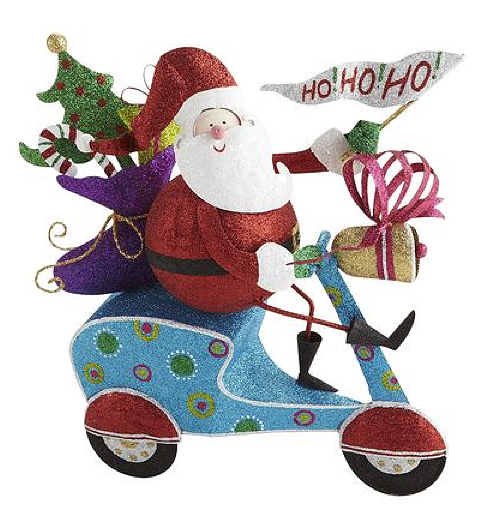 This scooter santa can be still found on eBay in different color combinations for a bit more. Thanks to Dixie K. for this photo and stealthy find. Find Garden Ridge store near you. No red noses but red smiles. OMG am I excited about this find! Finally! A scooter yard inflatable! 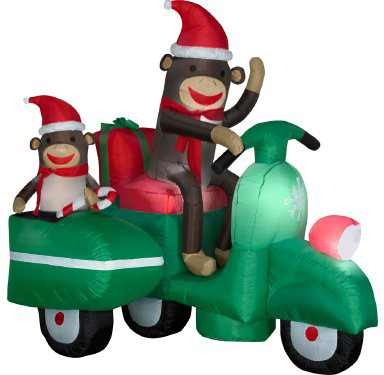 Even better – a scooter yard inflatable with SOCK MONKEYS! And a sidecar! That lights up! Wish I had found this a little earlier in the season. But it’s definitely not too late for the 2012 season. And it’s on sale. I have seen this offered for everything from $80 to $228 on the web but $85 seems to be the going rate. Here are the details. Dimensions: 2.99″ H x 62.2″ W x 47.24″ D, lights up, weather resistant and includes everything needed for set-up. These inflatables are more than a little reminiscent of scooter riding sock monkey’s Rocko & Spanky. To read more about them and other sock monkeys, visit our past posts here .